Christine “Lady Bird” McPherson (Saoirse Ronan) is a feisty and stubborn senior that is itching to leave the suffocating confines of her home and family life in Sacramento. Constantly challenging her opinionated and uncompromising Mother Marion (Laurie Metcalf), a nurse struggling to keep the family financially stable after her Father Larry (Tracy Letts)loses his job, she frequently finds herself in hot water. 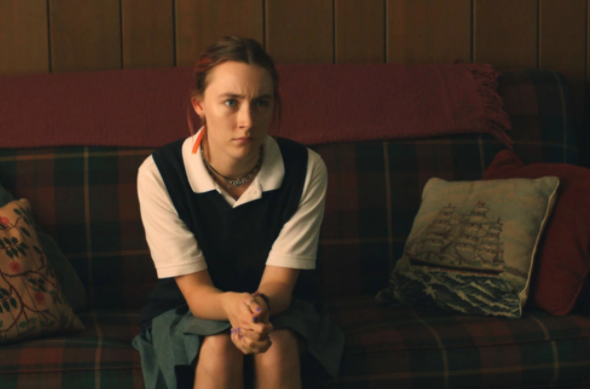 From misadventures to suspensions, “Lady Bird” at long last cracks her mother’s delicate foundation when it’s revealed she’s secretly applied to distant colleges on the East Coast. Director Greta Gerwig wisely poises humor and heartache. Her young cast completely understand and illustrate the uncomfortable and afflicting moments of adolescence intensively. The film primarily focuses on the troubled and tender relationship between mother and daughter, but it also touches on the consequences of false friendships and the unfulfilling attraction to materialistic things. Affluent with observance and composed with elements of pink fixations, a caring father figure and a girl who’s ashamed to live on the wrong side of the tracks, ‘Lady Bird’ seems both heavily influenced by ‘Pretty in Pink‘ and ready to redefine the label attached to the powder-puff color. This witty indie comedy energizes the allure of virginity with a soft rebel yell. In one unforgettable scene, ‘Lady Bird‘ depicts how so many first encounters with sexual intimacy are disappointing, and the high expectations we often have of the moment being special are almost never realized. The picture packs complexity in its characters and storytelling, and it never comes across as rushed or undercut. This entry was posted on Thursday, November 9th, 2017 at 11:27 am	and is filed under Film, News. You can follow any responses to this entry through the RSS 2.0 feed. You can skip to the end and leave a response. Pinging is currently not allowed. « The Entertainment Answer Radio Show – November 4th, 2017!